Home » Invasive Weeds » ASBOs for invasive species! On 11th February 2014, the Law Commission published its final report on Wildlife Law: Control of Invasive Non-native Species. 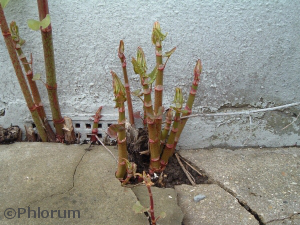 One idea being proposed is that any landowner that fails to take action to control the growth and spread of invasive species, such as Japanese knotweed (Fallopia japonica), on their land, could face a fine and/or jail sentence. The Law Commission is not just looking at Japanese knotweed but any species that can be proven to be non-native and which threatens the biodiversity and economy of an area, such as all the invasive species listed in Schedule 9 of the Wildlife and Countryside Act 1981, as amended. Under the proposals, bodies such as the Department for Environment, Food and Rural Affairs, the Welsh Government, and the Environment Agency could force land owners to either control the invasive species themselves, or allow these bodies to carry out the work under new Species Control Orders. Potential breaches of such Species Control Orders could result in large fines being levied (e.g. up to £40,000) or even a six-month custodial sentence being imposed. Land owners would have the right to appeal such notices at a tribunal, where appropriate, and would be compensated by any damage caused by the control works. The reason for the proposed law is that the existing laws do not contain sufficient powers to allow for the timely and effective control of invasive non-native species. The existing laws for wildlife management are overly complicated, frequently contradictory and unduly prescriptive. Consequently, the law creates unnecessary barriers to effective wildlife management, including the efficient implementation and enforcement of Government policy. “Invasive non-native species are a threat to biodiversity. Early detection and eradication are essential to protect native species and minimise damage to the environment. There is also an economic price to pay, with some invasive species plants and animals capable of causing significant damage to property and costing a great deal to control and remove. It is in everyone’s interest if the relevant governmental bodies and landowners can reach an agreement that allows for invasive non-native species to be eradicated or controlled. But this is not always possible. Species control orders are a proportionate and necessary response to an increasing problem”.